Designed by actual cat owners, the iPrimio Sifter with Non-Stick Litter Scooper has everything cat people would want in a litter scoop. 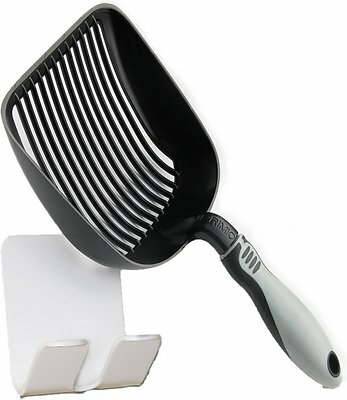 It’s made from cast aluminum that’s coated in Teflon for a sturdy scooper that doesn’t stick to wet litter. The deep shovel design features perfectly spaced sifting slots that trap solid messes but allow clean litter to fall through. The ergonomic handle has a solid core that makes it easier to hold than the average litter scooper. And with a reinforced front edge, it can push through difficult clumps that cling to the bottom of the box. The iPrimio Sifter gets into all the corners and works well with covered or open litter pans. 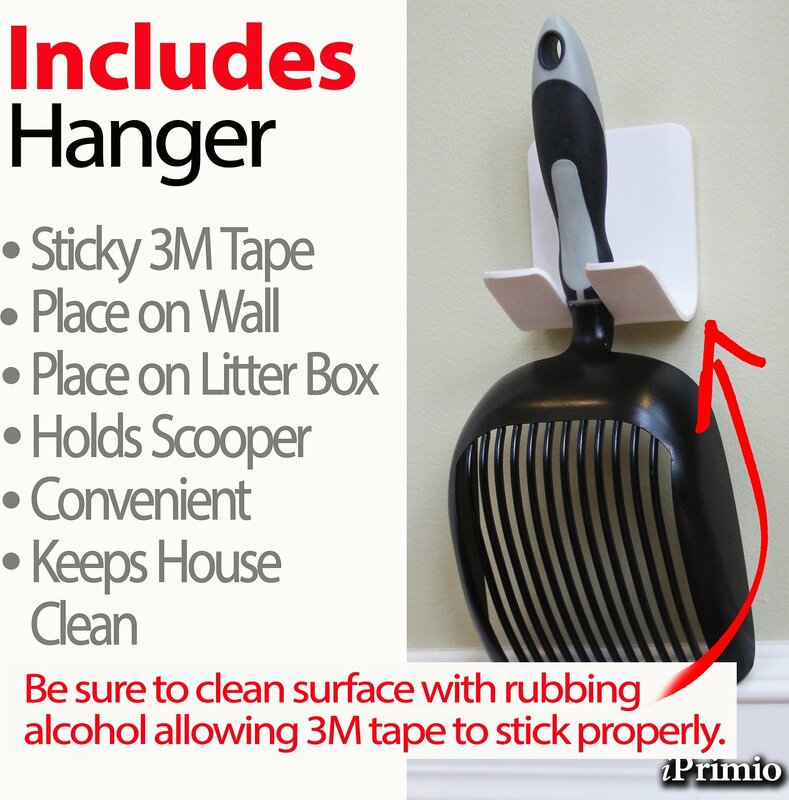 A plastic hanger is included so you can hang the scoop on the wall or on the side of the litter box. Made from non-stick coating so wet litter won’t stick. 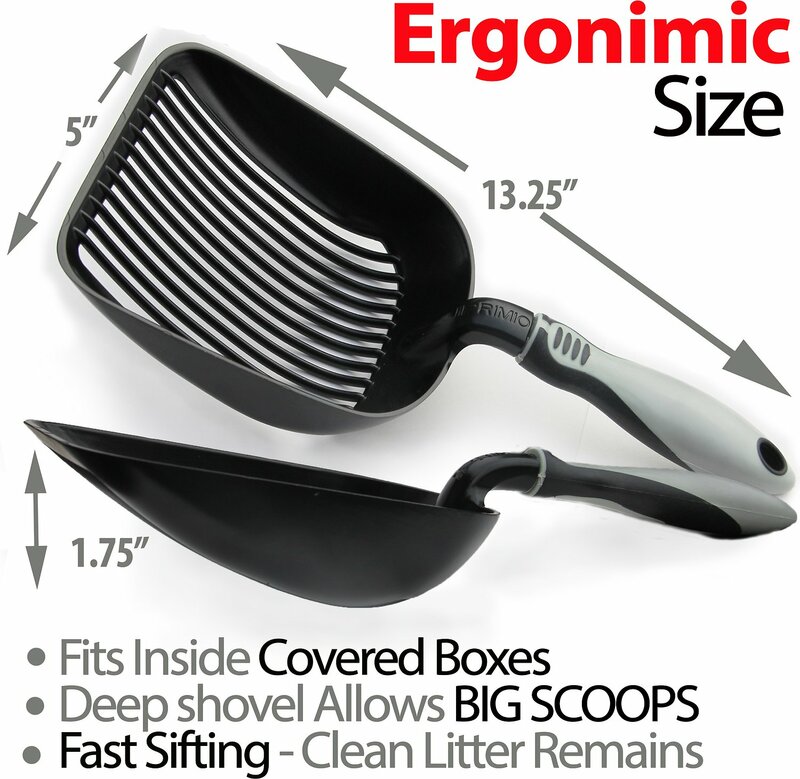 Deep shovel design features perfectly spaced slots that trap messes and allow clean litter to sift. Ergonomic handle has a solid core that makes it easy and comfortable to grip. Reinforced front edge can push through difficult clumps that cling to the litter box bottom. Includes a plastic hanger so you can easily hang on the wall or on the side of the box. Non-stick is very correct as in the holder wouldn’t even stick to the wall. The scoop it’s self is supposed to be non-stick yet my scoop has litter stuck all over it. It’s obvious the people who made this don’t have cats as they would know that wet litter sticks to everything. I would truly avoid this product as it has to sit on the floor covered in used litter because it really is non-stick. Find another scooper cause this one is a complete waste of money. We are a multiple cat home with 3 Very Large litter boxes, with 2Xs daily cleaning. Having 40+ years with litter boxes, we have used everything on the market and whatever works; even slotted cooking utensils and spatula (in desperation even tried chopsticks! ), and even tried to make something to fit our needs (failed miserably!). We were skeptical but decided to give iPrimio a try and it far exceeded our expectations. It wont break like plastic (broke 4+ in a year) and easy to clean. It ploys though the litter and gets the job done and we couldn't be happier. Now we can throw out the spatula and other utensils we have been using. Why on earth have I been using plastic scoops all this time??? WHY? This thing is wonderful. Teflon coating, nice heft, and incredibly well made. Does poops get stuck on it? Yes. Finish all the scooping, then rub it in the clean litter--voila, clean scoop. Taking heed of the complaints about the holder, I nailed it into an convenient beam in my basement and it works like a charm. Absolutely love this thing, can't believe it took me so long up get a decent poop scoop. Pros: This is the sturdiest litter scooper I've ever owned. It is also the biggest, which means less 'scoops' to get the clumps. Cons: The deep grooves clog up with the wet clumps. However, I read one of the reviews that said the cat owner keeps chlorex wipes by the litter box and wipes the scooper down after every use. I started doing that with baby wipes (I have them on hand) and it works great. I thought I would use the holder, but I haven't. 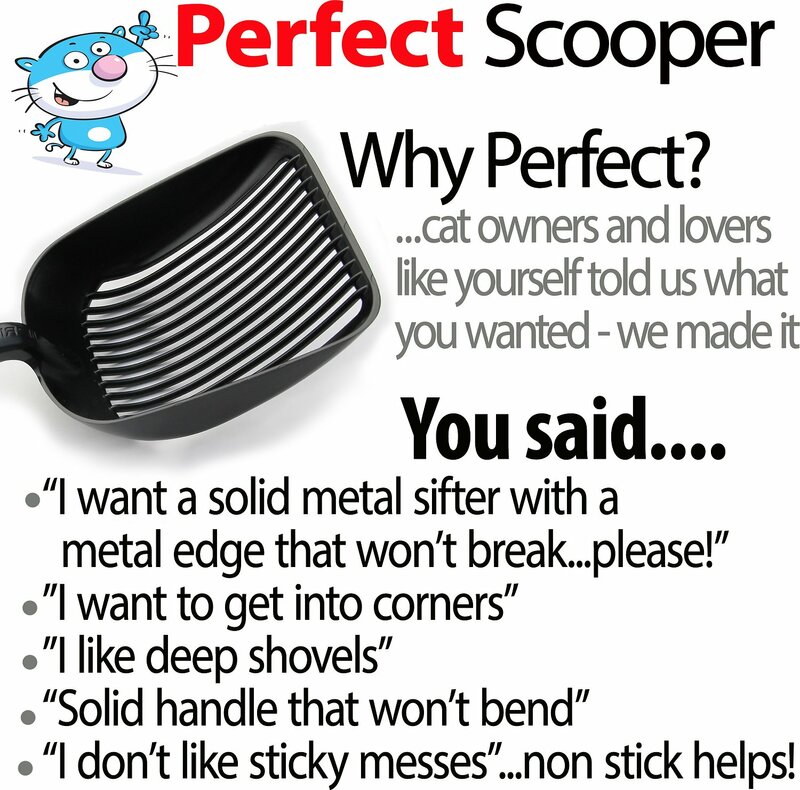 With the wide flat bottom edge, the scooper leans up against the wall by the litter box just fine. Can't believe I'm writing a review for a poop-er scooper! I first thought the tines were not close enough and would allow too many 'bits' to fall through. I was wrong. Once I gave it a real chance I have come to like it a lot, especially my cat has Kidney disease (CKD) which requires him to drink a lot more water and have a lot more substantial litter deposits. The larger metal scoop is perfect for this. 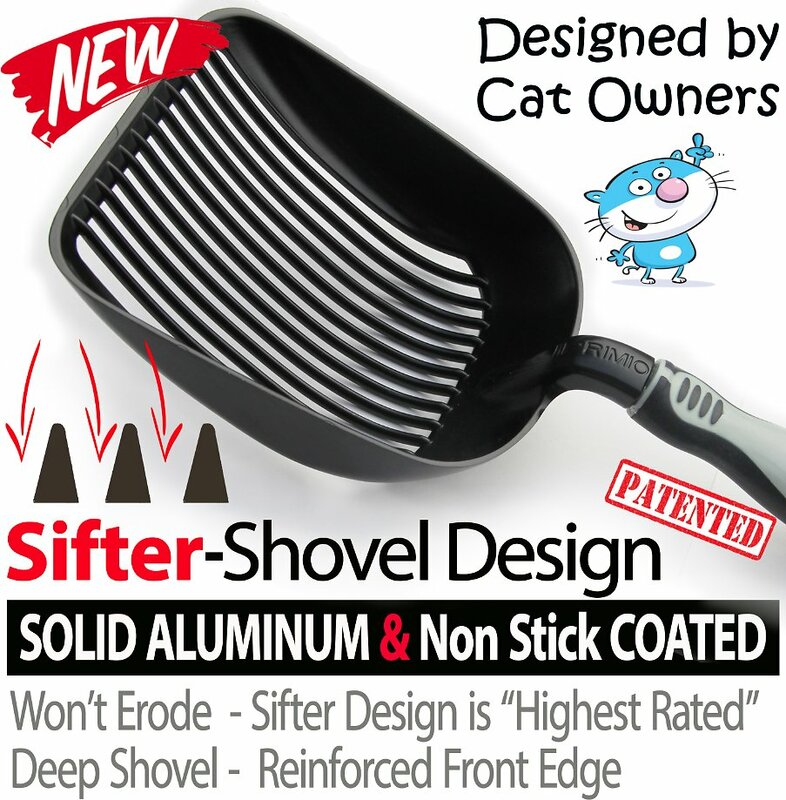 The only partial dislike is it's 'square' head is not 100% compatible with my round litter box, BUT, that's not a show stopper and if your cat has CKD and you have large, heavy, litter deposits, I highly recommend this scoop. I have been using this scooper for 3 months now and I love it. Prior to buying this one I had spend the last 9 months looking for a scooper that had a nice large scoop, a shorter handle for getting the right scooping angle, and something that wouldn't break or bend after a month of use. This scooper has everything I wanted! I am using this in a household with 6 litter boxes. We use Dr. Elsey's Ultra clumping litter. And, 3 of my cats have kidney disease, so they pee A LOT! This scooper stands up to all that hard work, and also is super easy to scrub clean. I will never go back to plastic! I cannot believe I have been scooping with flimsy plastic ones for sooo long. The quality and sturdiness of this metal product is awesome. The sticky thing it came with is stubborn so make sure to hold it firmly against what your adhering it to for a while and use the screw if you are able. I've tried plastic scoops and other metal scoops. The wet litter really sticks to all of them. The smaller clumps fall through the metal scoops. This one catches more of the small clumps and the wet litter doesn't stick to it as much as all the others. Not absolutely perfect, but the best so far.